SEW-1120ER Capable of measuring Earth Voltage. 2mA measuring current permits earth resistance to test without tripping earth leakage current breakers in the circuit. Standard accessories for 3T and 2T. Designed to met IEC/ EN 61010-1, IEC 615575-5 CAT III 200V. The SEW 1120 ER is a " professional instrument " . The instrument is suitable for the testing of single earth electrodes such as lightning conductors and other small earthing system. The resistance of conductors such as continuity and conduit coupling joints can also be measured. Two-terminal operation measurement, which reduces the accuracy, can also be done by shorting P and C terminals. 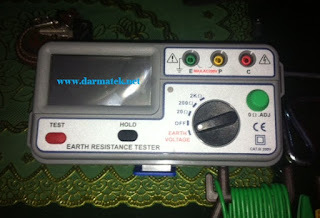 Earth resistance can be measured directly from 0.01 Ohms up to 1999 Ohms. The reading is displayed on a large, easy-to-read digital display. It has a zero 0 ohm adjustment setting that is controlled by a dial feature. > The 1120 ER makes meaureents by passing a constant current through the device under test ( generally a conductor or low resistance) and measuring the voltage across it. The earth resistance is then calculated by Ohm' s law. It has an advanced circuit design that permits the instrument to operate with the minimum influence from earth voltage and earth resistance of the auxiliary spikes. This superb instrument is powered by 8 x 1.5 folt manganese-alkaline AA batteries. The calibration of the instrument is performed with the included test leads. Therefore, when using the supplied test leds, the accuracy does not suffer of the three-terminal method of measurement fro the most common applications. The test frequency of 820Hz has been chosed to avoid stray currents at power frequencies and their harmonics. However, the 1120 ER has a built-in filter to reject unwanted signals. The batteries are constantly being checked while in use. The case is ideal for outdoor work. with the 1120 ER can be used by the electrical contractor or maintenance engineer to check the effectiveness of thir type of earth electrode systems.